The Thermalert CM provides the advantages of infrared temperature measurement in a compact, low cost integrated sensor. 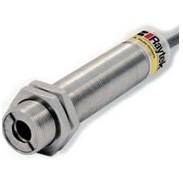 The CM can easily replace traditional contact probes with a type J or K thermacouple output, or with a 0-5 volt output if your application is susceptible to noise or requires a longer cable run. The CM is designed to measure target temperatures ranging from -20 to 500°C. The CM's onboard electronics are protected by a rugged IP65 (NEMA-4) stainless steel housing. Model J Thermacouple output type "J"
Model K Thermocouple output type "K"